Rogawski McQuade, Elizabeth T. (Liz), Ph.D., M.S.P.H. Dr. Rogawski McQuade is an Assistant Professor in the Department of Public Health Sciences and the Division of Infectious Diseases & International Health, Department of Medicine. She received her PhD in Epidemiology from the University of North Carolina-Chapel Hill with a focus in infectious disease epidemiology and international health. Her research interests are in pediatric enteric disease in low-resource settings. Specifically, she focuses on the complex interactions between early childhood diarrhea, enteropathogen infections, environmental enteropathy, antibiotic use, and their effects on child health and development. The majority of her fieldwork has been based in South Africa and India. As a faculty fellow in the Center for Global Health, she works with a multidisciplinary team of collaborators and students to study the effectiveness of a point-of-use water treatment technology to prevent child stunting in rural South Africa. 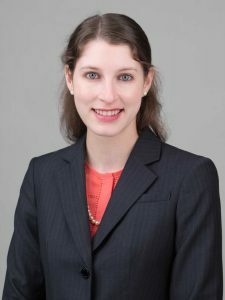 She is also interested in developing novel causal inference-based methods to generate epidemiologic evidence that is relevant to public health interventions and policy. Rogawski McQuade ET, Platts-Mills JA, Gratz J, Zhang J, Moulton LH, Mutasa K, Majo FD, Tavengwa N, Ntozini R, Prendergast AJ, Humphrey JH, Liu J, Houpt ER. Impact of water quality, sanitation, handwashing, and nutritional interventions on enteric infections in rural Zimbabwe: the Sanitation Hygiene Infant Nutrition Efficacy (SHINE) Trial. J Infec Dis. March 2019. In press. Rogawski McQuade ET, Clark S, Bayo E, Scharf RJ, DeBoer MD, Patil CL, Gratz JC, Houpt ER, Svensen E, Mduma ER, Platts-Mills JA. Seasonal Food Insecurity in Haydom, Tanzania, Is Associated with Low Birthweight and Acute Malnutrition: Results from the MAL-ED Study. Am J Trop Med Hyg. 2019 Mar;100(3):681-687. Rogawski ET, Liu J, Platts-Mills JA, Kabir F, Lertsethtakarn P, Siguas M, Khan SS, Praharaj I, Murei A, Nshama R, Mujaga B, Havt A, Maciel IA, Operario DJ, Taniuchi M, Gratz J, Stroup SE, Roberts JH, Kalam A, Aziz F, Qureshi S, Islam O, Sakpaisal P, Silapong S, Yori PP, Rajendiran R, Benny B, McGrath M, McCormick BJ, Seidman JC, Lang D, Gottlieb M, Guerrant RL, Lima AA, Leite JP, Samie A, Bessong PO, Page N, Bodhidatta L, Mason C, Shrestha S, Kiwelu I, Mduma ER, Iqbal NT, Bhutta ZA, Ahmed T, Haque R, Kang G, Kosek MN, Houpt ER. Use of quantitative molecular diagnostic methods to investigate the effect of enteropathogen infections on linear growth in children in low-resource settings: longitudinal analysis of results from the MAL-ED cohort study. Lancet Global Health. 2018 Dec;6(12):e1319-e1328. Platts-Mills JA, Liu J, Rogawski ET, Kabir F, Lertsethtakarn P, Siguas M, Khan SS, Praharaj I, Murei A, Nshama R, Mujaga B, Havt A, Maciel IA, McMurry TL, Operario DJ, Taniuchi M, Gratz J, Stroup SE, Roberts JH, Kalam A, Aziz F, Qureshi S, Islam O, Sakpaisal P, Silapong S, Yori PP, Rajendiran R, Benny B, McGrath M, McCormick BJ, Seidman JC, Lang D, Gottlieb M, Guerrant RL, Lima AA, Leite JP, Samie A, Bessong PO, Page N, Bodhidatta L, Mason C, Shrestha S, Kiwelu I, Mduma ER, Iqbal NT, Bhutta ZA, Ahmed T, Haque R, Kang G, Kosek MN, Houpt ER. Aetiology, burden and clinical characteristics of diarrhoea in children in low-resource settings using quantitative molecular diagnostics: results from the MAL-ED cohort study. Lancet Global Health. 2018 Dec;6(12):e1309-e1318. Rogawski ET, Platts-Mills JA, Colgate ER, Haque R, Zaman K, Petri WA, Kirkpatrick BD. Quantifying the impact of natural immunity on rotavirus vaccine efficacy estimates: a clinical trial in Dhaka, Bangladesh (PROVIDE) and a simulation study. J Infect Dis. 2018 Mar 5;217(6):861-868. Rogawski ET, Platts-Mills JA, Seidman JC, et al. Early antibiotic exposure in low-resource settings is associated with increased weight in the first two years of life. J Pediatr Gastroenterol Nutr. 2017 Sep;65(3):350-356. Rogawski ET, Bartelt LA, Platts-Mills JA, et al. Determinants and impact of Giardia infection in the first two years of life in the MAL-ED birth cohort. Journal of the Pediatric Infectious Diseases Society. 2017 Jun 6(2): 153-160. Rogawski ET, Platts-Mills JA, Seidman JC, et al. Use of antibiotics in children younger than two years in eight countries: a prospective cohort study. Bulletin of the WHO. 2017 Jan; 95:49-61. Rogawski ET, Gray CL, Poole C. An argument for renewing focus on epidemiology for public health. Annals of Epidemiology. 2016 Oct; 26(10): 729-733. Rogawski ET, Westreich DJ, Kang G, Ward HD, Cole SR. Estimating differences and ratios in median times to event. 2016 Nov; 27(6): 848-51. Westreich D, Edwards JK, Rogawski ET, Hudgens MG, Stuart EA, Cole SR. Causal impact: epidemiologic approaches for a public health of consequence. American Journal of Public Health. 2016 Jun; 106(6): 1011-1012. Rogawski ET, Meshnick SR, Becker-Dreps S, Adair LS, Sandler RS, Sarkar R, Kattula D, Ward HD, Kang G, Westreich DJ. Reduction in diarrheal rates through interventions that prevent unnecessary antibiotic exposure early in life in an observational birth cohort. J Epidemiol. Community Health. 2015 Nov; 70(5):500-505. Rogawski ET, Westreich D, Becker-Dreps S, Adair LS, Sandler RS, Sarkar R, Kattula D, Ward HD, Meshnick SR, Kang G. Antibiotic treatment of diarrhea is associated with decreased time to the next diarrhea episode among young children in Vellore, India. Int J Epidemiol. 2015 Jun; 44(3): 978-987.